I first heard of Sacred Harp singing in Cork about four years ago. I’m not sure how or where. I had a very vague awareness of shape-note singing, but more how the shape-notes worked than what it sounded like. I remember around late 2011 or early 2012 a group of Cork singers came to Limerick (the city I live in, about sixty miles from Cork) to sing in a pub one Sunday afternoon but I missed the opportunity to actually see them sing. I did take a note of it, and I’m almost sure my friend Albert who lives in Cork (and is a flatmate of Sinéad Hanrahan from the Cork singers) mentioned bits and pieces about Sacred Harp to me. As a documentary maker, I am constantly filling pages of notebooks with ideas for potential programs. Many of these never get past a scribble. Others go a little further, but as a freelance producer, quite a lot never make it to the commissioning stages. Anything and everything takes my interest, and I’ve made documentaries on a wide range of topics from barber shops to football supporters to historical pieces. It’s frequently things I have very little prior knowledge about; sometimes it is better to be an “outsider” in that you ask the very stupid and basic questions—although I subsequently discovered that there’s no such thing as an “outsider” in the Sacred Harp international community, such is the inclusiveness central to its ethos. 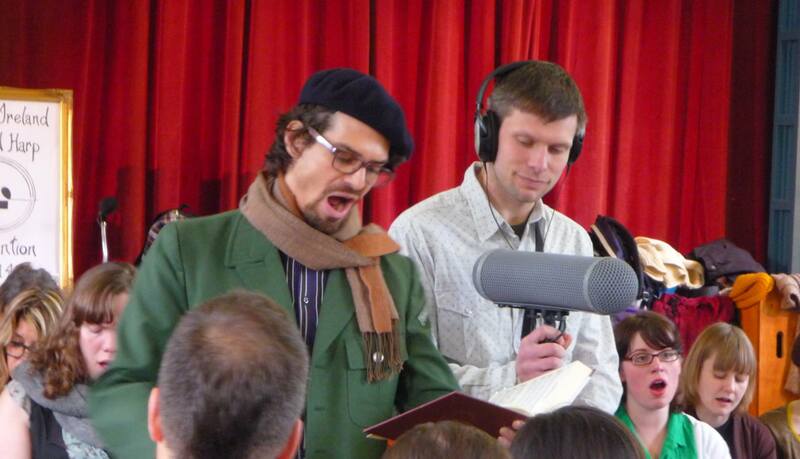 Ciarán Ryan and Aaron Kahn at the 2014 Ireland Sacred Harp Convention. Photograph by Daragh McCarthy. Over a year ago I approached RTÉ Lyric FM, a national classical and arts station that is part of our national broadcaster in Ireland, RTÉ. Once funding was secured, I started working on a documentary in March 2014 at the fourth annual Ireland Sacred Harp Convention in Cork. I had never actually heard Sacred Harp singing live—all my research had been based on YouTube footage—so it was very much jumping in at the deep end. I was blown away that weekend, by the musicality to an extent, but more so by the positive energy that was bouncing around the room. Everyone—Corkonian and international—was incredibly welcoming to me, which made the recording experience a lot easier. As a documentary producer I do try and be as unobtrusive as possible, but at times it was difficult to be inconspicuous when waving a big microphone around. By the Sunday of the weekend, I had been generously invited into the center of the hollow square by a singer I met, Aaron Kahn, who is originally from the United States but is now based in Hong Kong. The production continued through 2014; I probably made another four or five trips to Cork to record with various singers and at different events. I found that people were very open to talking about their own personal experiences with singing, and were enthused about the documentary. Perhaps the biggest challenge was trying to replicate the sound of the singing, especially when it’s a larger group. I’m not a sound engineer, so this did require some particular care. Of course, it’s next to impossible to actually capture what happens at a Sacred Harp singing unless you attend one, but I hope some of my recordings help to give an idea! The documentary has received some nice feedback from both Sacred Harp singers and non-singers both at home and internationally. I hope to meet some more singers at this year’s convention in Cork. This time I will be coming without my microphone!